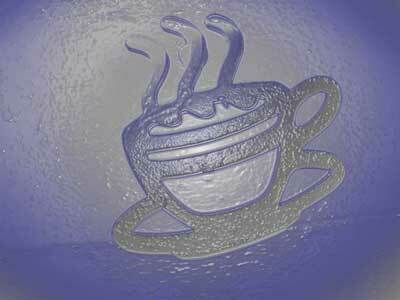 WiRed JavA fAnatiC is back with some of the best information and news on the wonderful world of coffee. If you are interested in viewing the old version, visit the Wayback Machine. Ca phe sua da or cafe sua da is a Vietnamese coffee recipe that means "coffee milk ice". It is made by mixing brewed coffee with about a quarter to a half as much sweetened condensed milk and then pouring it over ice. Medium roasted Vietnamese-grown robusta coffee is traditionaly used as arabica coffee beans do not grow very well in Viet Nam due to the plant diseases and low-attitude. However, the unique brewing style and addition of sweet condensed milk gives it a special flavor worthy of gourmet status while still retaining the extra caffine kick (robusta beans can contain twice the caffine than its arabica cousins). The coffee is individually brewed in a small metal Vietnamese drip filter called a ca phe phin that drips the blend into a cup containing the condensed milk. A heaping teaspoon of coffee, ground to a medium to course consistency so the grounds do not leak into the coffee cup, is placed in a special Vietnamese style filter. A top screen is then placed on top of the grounds and screwed down tight. This is then placed on top of a small cup (about 4 oz.) and filled with boiling water until it is about 1/4 full. After the grounds have moisturized, about 30 seconds, the top screen is loosened one full turn. Now the filter is filled with water just below the boiling point and a lid is placed on top. This process can take 5 to 15 minutes depending on how tightly the top filter is screwed on. Cafes that screw it on more tightly will place a can of sterno under the cup to keep it hot if they are making ca phe sua nong (hot milk coffee - made without ice). Enjoy! 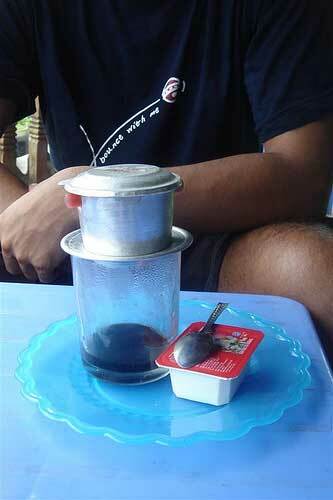 If it is drank like this it is called "ca phe den" or black coffee. To make milk coffee or "ca phe sua", pour 2 oz. of sweetened condensed milk in the bottom of the glass before brewing. Stir before drinking. The filters can be found in Asian markets and cost about five dollars. Many Vietnamese restaurants will brew it for you this way, even if its not on the menu.